Belichick Breakdowns: What we can learn about football (and the Patriots coach) from "The Belestrator." 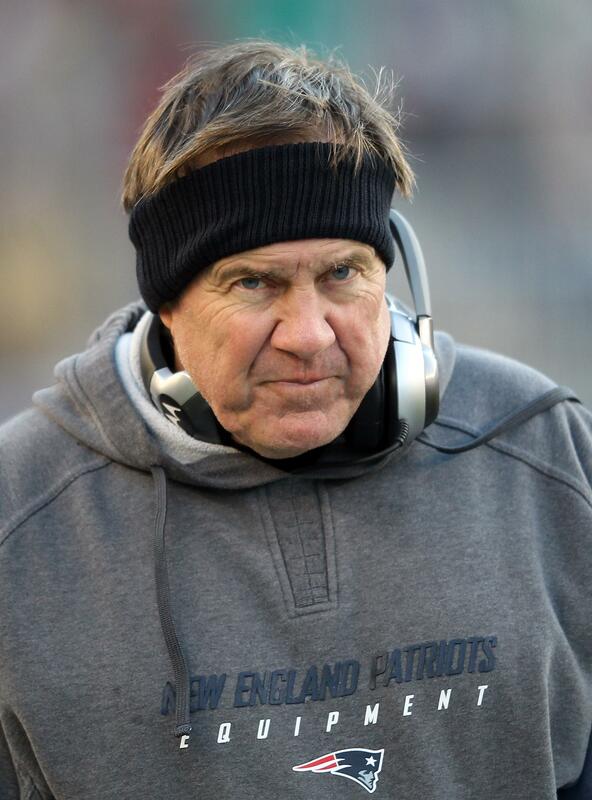 Patriots coach Bill Belichick on the sidelines during a December game against the Miami Dolphins. Photo by Jim Rogash/Getty Images. Those in search of revealing Bill Belichick moments almost never find satisfaction. Provocative press conference questions are met with variations on “Look, we’re just focused on preparing for the Dolphins this week.” The Hoodie doesn’t get expansive. It is what it is. There are exceptions. Belichick obsessives—I count myself among them—know that B.B. can light up when asked to lecture on football history and technique. The evolution of a certain strain of defense. The importance of leverage in blocking. The manifold talents of Mark Bavaro. But if you want the best insight into this emotionally opaque being, you have to watch the “Belichick Breakdowns” posted on patriots.com. After each regular-season Patriots win, Belichick chooses a few plays to analyze in depth. If you’ve never seen the Belestrator in action, you’re in for a treat. The Belichick Breakdown of the regular-season game between the Patriots and Broncos focuses entirely on the Pats offense. That’s a bit disappointing, as I have little fear that the Pats will get their points against the Broncos on Saturday. Barring a breakdown of the Patriots’ offensive line (which is not unprecedented in recent Pats playoff performances), it’s hard for me to imagine the Broncos defense dominating. Denver made a concerted effort to take away Wes Welker and Rob Gronkowski in that first game, but the result was Aaron Hernandez recording career highs in receptions and yards. The Pats were never even slowed down, never mind shut down. The Pats defense was a different story. In that earlier meeting, the Broncos rushed for 167 yards in the first quarter. They scored on each of their first three possessions, including two rushing touchdowns. But a disastrous second quarter saw 1) Willis McGahee get knocked out of the game, and 2) the Broncos fumble the ball away three times in their own half of the field. So when you remember that 41-23 final score, don’t forget that the Pats defense swayed perilously on its heels before the Broncos shot off their own feet. Also of possible comfort: The safeties the Pats started in that first Broncos game were perhaps the weakest pair fielded by any NFL team this year. Free safety Matthew Slater was a converted wide receiver/special teams gunner who’d never played defense in the pros until well into this season. Strong safety James Ihedigbo was … not good. Though we often think of safeties as pass defenders, it was in the run game that this duo made their atrocious presence felt. Ihedigbo and Slater repeatedly missed tackles, turning moderate rushing gains into epic gashes. The return of strong safety Patrick Chung, a very solid tackler, could make a huge difference. And I am tantalized by the possibility that the Pats will play cornerback Devin McCourty as the deep safety in this game. After a spectacular rookie season, McCourty has been torched in his sophomore year by deep throws on which he’s failed to turn around and play the ball. (My completely unsubstantiated theory: his shoulder injury has made it tough to turn his head.) Moving McCourty back to safety would let him face the QB more, and he could hardly fare worse than Slater or the Pats’ other overmatched free safety, Sergio Brown. Sadly, we have no Belestrator take on Tebowing. But I like to think that Coach Bill would focus on technique. Elbow angle. Kneeling depth. You know, the important stuff.